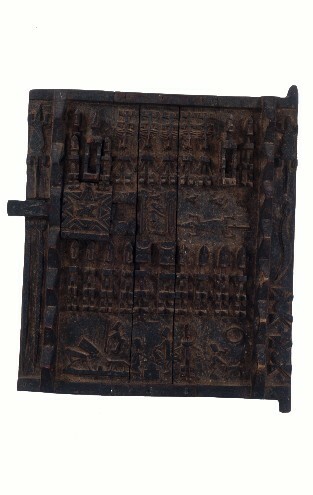 23" x 19" x 2.25"
The Dogon people are well known for their expertise in carving, especially on granary doors such as this one. Granaries are rectangular or circular two-story structures meant for storing harvested grains. Pictograms typically decorate the doors, illustrating ancestors who protect the harvest, animal spirits overseeing fertility and, at times, the Dogon creation myth. This door includes all of these elements. Along the edge are birds, lizards, scorpions, and snakes. Masked figures appear in the upper and central portion. The bottom third of the door has many of the elements found in the creation myth such as a female with a termite hill, a jackal, a figure holding twins (birds? ), a scorpion, a lizard, and a sun (or egg) shape. Beloit College Art Museum, 2002, ob.LMA 2278; Feldmann, 1963, pp.67-68.